BMW E65 E66 E67 E68 PARKING BRAKE GEAR REPAIR KIT FOR ACTUATOR 745i 750i 760i / Free shipping in US & Canada ! Replacement gear for the common BMW E brake light on dash, when park brake fails to engage. 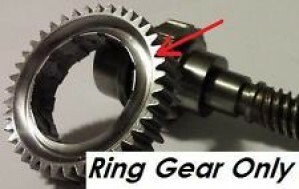 This new steel gear replaces the old broken plastic gear inside the actuator. The new steel replacement gear is guaranteed for the life of the vehicle. This SS41 Metal designed gear is made to hold up against prolonged use, and regular gear engagement. METAL REPLACMENT GEAR W/ LIFETIME WARRANTY WON'T BREAK (Included (1) Metal replacement Ring Gear) 2002-2008 7 series all engines E65 745i Sedan, N62, AUTO E65 735i Sedan, N62, AUTO E65 735Li Sedan, N62, AUTO E65 750i Sedan, N62N, AUTO E65 760i Sedan, N73, AUTO E65 760i Sedan, N73, AUTO E65 B7 ALPINA Sedan, N62, AUTO E66 745Li Sedan, N62, AUTO E66 750Li Sedan, N62N, AUTO E66 760Li Sedan, N73, AUTO E66 760Li Sedan, N73, Auto Rolls Royce: 2004-2008 Phantom Manufacturer Part Number: 09 5584 010 / 09-5584-010 / 34436782755 3440676260 Interchange Part Number: 095584010, 34436782755, 3440676260, 34406762606 Other Part Number: 34436782755, 34406762606, 924-395, 09 5584 010 Surface Finish: SS41 STEEL BMW E65 E66 (02-08) Gear Repair Kit for Parking Brake Actuator! LIFETIME Warranty: GEAR REPLACEMENT WARRANTY! Easy installation process Very strong Die Casting Gear! Quick Delivery Times! Express Air mail for all items / Items in Stock ready to ship to your door.